When invited to review this production my first alarming realisation was that I had no idea where the lady came in the procession of Royal wives. In fact, until the performance I had been unaware that she was only 20 at the time of her appointment with the block at the Tower. I needed a lesson in Tudor history. How dull! Dull? DULL? It was enthralling. A lonely child and a lonely monarch each seeking love and manipulated by courtiers; their happiness destroyed by an Iago-like Cranmer; the child betrayed by those wishing to save their own skin and the monarch sentencing her to death to save his pride. The programme contained historical notes and was worth the 1.00 demanded by friendly stewards. 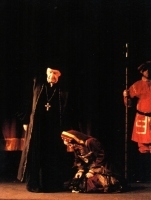 A simple set by Carole Sammon based on three levels and hangings displaying the Tudor Rose, good lighting (Ed Hopkins) and magnificent costumes (Margaret Thorp) complemented the script. Commiserations to the cast who had heavy costumes to wear during a hot and humid week. 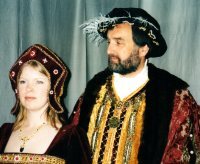 We opened on the wedding night of Henry VIII and Anne of Cleves. In the latter role Amanda Matravers looked exactly right a tiny physique, a little glum face and a white coif. I loved this performance always when on stage there was an undercurrent of comedy (no mention in the marriage settlement speech of the house at Haverhill). It is said that the King stood 6' 2" with a 32" waist that had increased, by 17" when he married Katherine Howard. I have no idea of Martin Woodruff's dimensions but he certainly looked like a mountain of flesh and gave a considered and robust performance. I liked Katherine's lift of her arms in the execution scene prompting Henry's 'My bird has flown.' Silly, silly man! Elizabeth Graham looked pretty and demure as Katherine Howard but played rather on one level, particularly during the early part of Act 1. We could have been shown a little more of the initial shock of hearing Norfolk's plans perhaps a smidgeon of pleading, desperation, defiance; but from the time of her introduction to the King when submission was required, this actress was on surer ground from the downcast eyes to the confidence of a consort to the agony of 'Am I going to die?' - an attractive performance. I have only heard the word procuress applied to old hags in Dutch paintings so it was rather a shock to hear the word as a reference to the elegant Sally Marsh, who, as Lady Jane Rochford, put across a glacial guile and delivered the planting of the seed speech with a degree of coyness coupled with the prosaic manner of a biology teacher. I felt no compassion for the character as she went to execution. I could not say this about Thomas Culpeper whom Derek Matravers depicted as an honest devoted swain, his scenes with Katherine were loving and tender, and he didn't deserve the block. I liked Nick Warburton's performance as the brutish wicked uncle; the weighty performance from Derek Brown as Cranmer, and William played by Alan Robinson few lines but great concentration throughout as the oily lackey with a busy quill pen. Rosie Wilson's Mrs Hall could have benefited from the adoption of the confidential air of the gossip, but a pleasing cameo, and an even tinier one from Ron Meadows as Sir Thomas Wriothesley. Finally the many extras performed their tasks with meticulous precision. 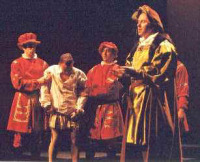 A very good production, audiences were appreciative and that is the main thing. Colin Lawrence, director, should be pleased. He's already given us Anne Of The Thousand Days and A Man For All Seasons. Should we now be booking for The King's Mare?